In 1979, Gerard J. Dullea (1943- ) was appointed USCF executive director. In 1979, there was no U.S. chess championship due to lack of funds. In 1979, Irina Levitina (1954- ), a 4-time USSR Women's Chess Champion, qualified but was not allowed to play in the 1979 Women's Interzonal because her brother legally emigrated to Israel. In 1979, Istvan Bilek (1932-2010) agreed to 10 short draws out of 10 games at Slupsk. He played only 125 moves in 109 minutes in 10 games. In 1979, Yasser Seirawan won the US Junior Invitational in Hollywood, California. He later won the World Junior Chess Championship. In 1979, two players in the Wyoming State Chess Championship resigned at exactly the same moment. In the June 1, 1979 issue of Scientific American, there was a column, written by Martin Gardner, called "Mathematical Games" that discussed chess problems on a higher plane, including mirror images, rotations, and the superqueen. In 1979, Vlastimil Hort and Gyula Sax tied for 1st at the IBM International in Amsterdam. In 1979, Georgy Bastrikov (born in 1914) died in Russia. He was one of the top trainers in Russia. In 1979, Army SP4 Michael Fletcher won the 20th US Armed Forces championship. Army won the team championship. The event was held at the American Legion Hall of Flags in Washington, DC. In 1979, 2nd Lieutenant Bill Wall (1951- ) won the Lackland AFB and Wright-Patterson AFB championships and represented the Air Force in several Armed Forces events. In 1979, Victor Ciocaltea, Slobodan Martinovic, Juraj Nikolac, Jesus Nogueiras, and Nikola Spiridonov were awarded the Grandmaster title. In 1979, Jorge Massana and Neil McKelvie tied for 1st in the Manhattan Chess Club championship. In 1979, at the age of 16, Garry Kasparov took 9th place in the 46th Soviet championship in Tbilisi. He was considered the strongest 16-year-old in the world. 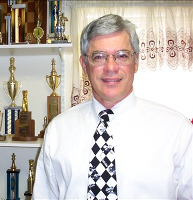 In 1979, Andy Soltis won the Marshall Chess Club Championship. In 1979, Anatoly Karpov won the Chess Oscar for the 6th time. In 1979, Karpov won at Montreal, Waddinxveen, and Tilburg. All three events were Category 15 events (average rating over 2600). In 1979, Jacqueline Piatigorsky (1911-2012) was one of the first recipients of the Koltanowski medal for the promotion of chess. In 1979, Grandmaster Lev Alburt defected from the USSR to the USA. Speaking at Harvard's Russian Research Center, Alburt said some Soviet grandmasters were "used as KGB infiltrators." In 1979, Patrick McKenna, a prisoner in Nevada, strangled his Las Vegas cellmate, Jack J. Nobles, after an argument over a chess game in which he lost. He has been on death row since then. He was once considered as Nevada's most dangerous inmate. He was denied parole in the latest of a long line of appeals. In 1979, Arthur Bisguier (1929- ) won the USCF Grand Prix, sponsored by Church's fried chicken. In 1979, Milan Matulovic (1935-2013) was convicted of vehicular manslaughter and was sentenced to 9 months in prison for a car crash in which a woman was killed. Matulovic complained that the sentence was too long because, "...she was only a Bosnian." In 1979 Tigran Petrosian (1929-1984) took first at Tallinn with 8 wins and 8 draws. He then tied for first place with Huebner and Portisch at the 1979 Rio de Janeiro interzonal. In 1979, Florin Gheorghiu won the US Open, held in Chicago. There were 563 players. In 1979, the Fiji Chess Federation was formed. In 1979, the Soviets arrested and jailed Viktor Korchnoi's son as a "draft dodger." In 1979, Chafitz Incorporated introduced their Chafitz Modulare Game Systems and Boris 2.5 Game Module Chess Computer. In 1979, the concept of chessboxing was brought to a wider audience after being featured in a movie called Ninja Checkmate. In 1979, International Master David Levy (1945- ) defeated Chess 4.8. In January 1979, Don Oswald (1934-1994) bought The Chess House from Jack Winters (1939-2003). Many of my chess books came from The Chess House. On January 15, 1979 Guinea-Bissau issued a chess stamp of children playing chess. On Jan 31, 1979, GM (2007) Farid Abbasov was born in Azerbaijan. In 1997, he took 2nd in the European Youth Chess Championshhip. In 2007, he won the gold medal at an international tournament in Laholm, Sweden. Unfortunately, thieves broke into his hotel room and stole his laptop computer, flight ticket, and documents. He coaches the Azerbaijan Youth chess team. On Feb 1, 1979, GM (1997) Aleksandr Galkin was born in Russia. In 1999, he won the World Junior Championship. In February, 1979, George Koltanowski (1903-2000) set a world record for playing and beating four opponents simultaneously blindfold at the age of 75. On February 19, 1979 Comores issued three chess stamps. On March 12, 1979, child prodigy Jorge Zamora (now known as Jorge Sammor-Hasbun) was born in Honduras. He is a FIDE master. On March 18, 1979, Niaz Murshed won the Bangladesh chess championship at age 12, 309 days. He is the youngest country chess champion ever. 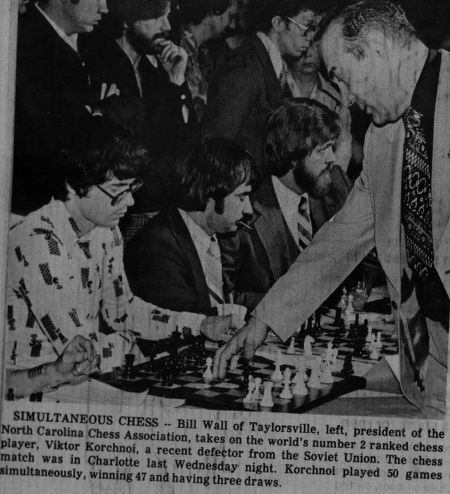 On March 21, 1979, Viktor Korchnoi gave a 50-board simul in Charlotte, NC. I lost after 37 moves. On April 4, 1979, Svetozar Gligoric, Vladimir Liberzon, Vlastimil Hort, and Florin Gheorghiu tied at the 9th Lone Pine International. On April 19, 1979, GM (2003) Antoaneta Stefanova was born in Sofia, Bulgaria. She won the FIDE Women's World Championship in 2004. On April 29, 1979 Uruguay issued a chess stamp to commemorate the 23rd Chess Olympiad in Buenos Aires. In May 1979, Walter Browne (1949-2015) and world champion Anatoly Karpov (1951- ) signed a contract to play a chess match in the late summer. Karpov was guaranteed $50,000 and Browne was to have the white pieces in every game. The match was never played. On May 6, 1979, Anatoly Karpov and Mikhail Tal tied in the Montreal International. On May 12, 1979 Hungary (Magyar) issued a chess stamp (3 forint value) to commemorate the 23rd Chess Olympiad (Sakkolimpa) in Buenos Aires in 1978 and Hungary's victory. Pictured on the stamp are a few chess pieces and a board, the golden Olympic cup, the 5-ring Olympic emblem, with the flag of Argentina as well as the Hungarian tricolor. On May 26, 1979, Viktor Korchnoi won at Johannesburg. His Elo rating was 2695, his peak rating. On June 14, 1979, Igor Bondarevsky (1913-1979) died in Piatigorsk, Russia at the age of 66. He was USSR champion in 1940. He was awarded the GM title in 1950. On June 17, 1979, GM Alexander Motylev was born in Sverdlosk, Russia. In 2001, he won the Russian chess championship. In 2014, he won the European chess championship. On June 20, 1979, Billy Watt (1959-1979), a promising and active chess player in North Carolina, died in a car accident in Taylorsville, NC. His father started the Billy Watt Memorial in Statesville, NC, in which I was the first tournament director. On June 27, 1979, Arthur Dunkelblum died in Anvers, Belgium. He was Belgian champion in 1949. He was awarded the IM title in 1957. On July 8, 1979, Harlow Daly (born in 1883) died in Framingham, MA. He won the Maine State Chess Championship 9 times. He was 85 when he won his last Maine state championship. In July 1979, Garry Kasparov won an international tournament in Banja Luka, Yugoslavia, scoring 11.5-3.5, two points ahead of his closest rivals, all grandmasters. Kasparov's first FIDE rating was 2595, making him the 15th highest rated player in the world from his first rated tournament. This may also be the record for the highest initial FIDE rating. On August 15, 1979, Hedley Abbott died in Cashmere, New Zealand. He was 1936-37 New Zealand chess champion. He was born in 1904. On September 8, 1979, GM (1994) Peter Leko was born in Subotica, Serbia. In 1994, he became the world's youngest grandmaster at the time. In 1996, he won the world under-16 championship. He has been ranked as high as 4th in the world. From October 28 to 31, 1979, the ACM's Tenth North American Computer Chess Championship (NACCC) was held in Detroit. CHESS 4.9 won the event. The other programs were BELLE, DUCHESS, MYCHESS, L'EXCENTRIQUE, CHAOS, SARGON 3, OSTRICH 80, BLITZ 6.9, AWIT, BS6676, and RUFUS. On November 6, 1979, chess master Cecil John Seddon Purdy (born in 1906) died. He collapsed while playing in a chess tournament at the Chess Centre of New South Wales in Australia. His final opponent was Ian Parsonage. Purdy's last words were, "I have a win, but it will take some time." On November 12, 1979, IM Gavriil Veresov died in Minsk, Belarus. He was born in 1912. Veresov was a five-time winner of the Belarusian Chess Championship (1936, 1939, 1941, 1958, and 1963). In November 1979, the 15th American Open, held in Santa Monica, was won by Perry Youngworth. On November 30, 1979, GM (2007) Simon Ken Williams was born. In 1993, he won the British under-12 championship. In 2005, he won the British Blitz Championship. On November 30, 1979 the Republic of Mali issued chess stamps to depict four great chess masters. The masters were Alekhine, Bogoljubow, Janowski, and Wili Schlage (Schlage was a minor German player). On December 5, 1979, GM Rustam Kasimdzhanov was born in Uzbekistan. In 2004, he won the FIDE World Chess Championship in Tripoli. On December 7, 1979, an episode (Season 3, Episode 9) called "The Snare" appeared on The Incredible Hulk (TV series from 1978 to 1982). Dr. David Banner (Bill Bixby) is invited by a millionaire, Michael Sutton (Bradford Dillman), to play a game of chess on his private island after Banner (David Bennet) beats Sutton in a game of chess while waiting at an airport. They play at the millionaire's home and it is tied 2-2. They start the next game, but Banner's wine is drugged and he passes out on the chess table. The man turns out to be a hunter, and David is the prey. The episode was a variation on the short story "The Most Dangerous Game" by Richard Connell. On December 27, 1979, Efim Geller (1925-1998) won the 47th Soviet Championship, held in Minsk.